Being a big fan of cheeses from Abondance to Zamorano, I've decided to take the first step into home cheese making. While this is also a first step to train myself on the aging techniques I can eventually apply to dry curing meat, I'm also excited to (hopefully) turn out some tasty curds. This first attempt, however, has been a rather dodgy experience. 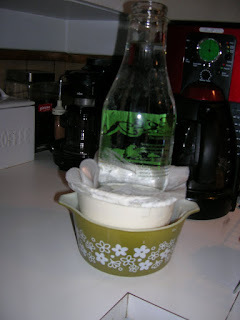 Dr. Fankhauser at the University of Cincinnati Clermont College operates a great website for explaining how to make homemade cheese using everyday materials and tools. It's very detailed and informative, plus I'm sure the recipes work great...if you follow them. Like beer, cheese is a highly perishable product, and needs a dominant, beneficial bacterial or other microorganism to keep nasty ones at bay. While beer uses yeasts, cheese uses a range of enzymes, which also add a lot of the characteristic flavors of cheese. The Dr's website showed how you could use buttermilk to inoculate the milk with enzymes, rather than fancy enzymes. I bought some fancy enzymes, though, which is where my troubles began. The buttermilk inoculation is suppose to sit out for about 12 hours. I did this with my enzymes, then read that they only need 30-60 minutes. Oops. When I added the rennet, the cheese seemed to set to curd, but as soon as I turned the heat on, the curd separated into tiny little beads. It reminds me of when I set my kefir out for 36 hours, it separates as the bacteria curdles the mild and gets wonderfully tangy and intense. Unfortunately, this isn't how the cheese was supposed to go. 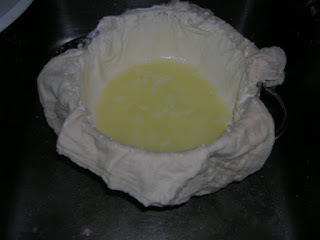 And it was a pain to strain these tiny little curds out of they whey in a colander lined with cheese cloth. But I pressed onward! I even made ricotta by cooking the whey! It was nice, although very tart. Rather than buying an $8 cheese mold, I heated a nail on my stove and melted dozens of tiny holes through the bottom of a 16 oz Tupperware container. Twenty-four hours later, I rubbed the rind with salt and let it sit in a tiny fridge set to 50 F. I brought the humidity up to 70-80% with some containers of salt water (the salt keeps microorganisms from spawning in the water). At this point, I'm not sure what will happen with the cheese. I am happy I discovered my mistake early on, and hopefully the cheese will at least turn out edible. The plan is to coax it along for a month, give it a small taste, then coat it in wax to age for another month. Right now (and I'm writing this two weeks later), it tastes a lot like wenslydale cheese (fresh and tart) with a texture like lancashire (very crumbly). 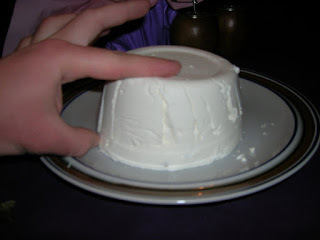 This blog on cheese -- in fact, the entire website -- is whey cool! What an education it provides on a range of food topics. And it does it with style and humor.